David Molk (born December 15, 1988) is a former American football center. Molk previously played college football at the same position for University of Michigan, where he was a consensus All-American and won the 2011 Rimington Trophy as the best center in college football. He played professionally in the National Football League (NFL) for the Philadelphia Eagles, and the San Diego Chargers. Molk grew up in the Chicago area and played high school football at Lemont Township High School. He was named an All-State player by the Chicago Tribune and was selected to play in the first East-West All-America Football Game in January 2007. Molk enrolled at the University of Michigan in 2007. He missed portions of the 2008 and 2009 seasons with injury. As a redshirt junior in 2010, Molk was the cornerstone in an offensive line that helped Denard Robinson break the Big Ten Conference single-season record with 4,189 yards of total offense. Molk was recognized as a first-team All-Big Ten Conference player at the end of the 2010 season. As a redshirt senior in 2011, Molk anchored a line that led the way for Denard Robinson and Fitzgerald Toussaint to become Michigan's first duo of 1,000-yard rushers since 1975. At the end of the 2011 season, he won the Rimington Trophy and was a consensus first-team All-American. Molk was selected by the San Diego Chargers in the seventh round of the 2012 NFL Draft. He appeared in 12 games, none as a starter, for the Chargers during the 2012 NFL season. Molk was once a 5-foot-6-inch (1.68 m) 175-pound (79 kg) Lemont Township High School freshman who could only bench press 110 pounds (50 kg) and squat 250 pounds (110 kg). By the end of his junior year, he was one of the most highly recruited high school football players in the Chicago metropolitan area. By his senior season, he was a 6-foot-2-inch (1.88 m) 270-pound (120 kg) center who could bench press 370 pounds (170 kg), squat 550 pounds (250 kg) and power clean 320 pounds (150 kg). His high school gym closed at 5:00 PM and he had to go into town for extra workout time. He chose to be a center because, although he is too short to be a major Division I college football offensive guard or offensive tackle, he had the potential to be a successful center. He was actually discovered when a scout came to his school to watch a teammate. During the summer prior to his senior season, he made a verbal commitment to the University of Michigan, in part due to its business school, the Ross School of Business. At the end of his junior year he had received scholarship offers from ten schools, including six Big Ten Conference football programs. As a senior, Molk was selected to numerous All-area football teams by various organizations including The Star, Daily Southtown, and Prep Football Report selected by Tom Lemming. In addition, he was selected to the Chicago Tribune All-State team, and he was selected to play in the first East-West All-America Football Game sponsored by ESPN and MLS Sports in Orlando, Florida suburb Lake Buena Vista on January 6, 2007. Molk was also an honors student in his senior year of high school. "Michigan Football Commitments". Rivals.com. Retrieved 2009-10-28. "2007 Michigan Football Commits". Scout.com. Retrieved 2009-10-28. "Scout.com Team Recruiting Rankings". Scout.com. Retrieved 2009-10-28. "2007 Team Ranking". Rivals.com. Retrieved 2009-10-28. 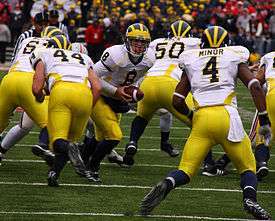 Molk (50) lines up a block during 2009 Michigan – Notre Dame game. Molk attended the University of Michigan, where he played for the Michigan Wolverines football team from 2007 to 2011. 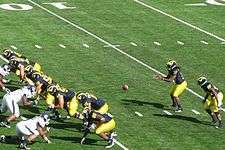 Entering the 2007 NCAA Division I FBS football season, Molk was a serious contender to start in the season opener due to injuries for the 2007 Michigan Wolverines football team. 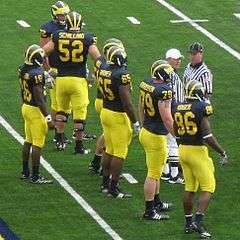 Upon the arrival of new head coach Rich Rodriguez in the spring prior to the 2008 NCAA Division I FBS football season, Molk was expected to be a starter for the 2008 Michigan Wolverines football team after redshirtting the prior year. He spent the summer after his redshirt season perfecting the shotgun formation snap. However, he endured a serious undisclosed illness that caused him to lose 15 pounds (6.8 kg) and found himself in a battle with redshirt junior David Moosman to be the starting center. As his struggles continued, it was revealed that he had mononucleosis. Despite his struggles, he was awarded the Iron Wolverine Award at the spring football awards in recognition of his superior conditioning based on a series of physical tests. As a result of injuries, both Moosman and Molk were in the starting lineup for the 2008 opener. Offensive line injuries continued to affect the lineup through the early part of the season with Molk (center), Moosman (right offensive guard) and Stephen Schilling (right offensive tackle) being the only players to start each of the first four games. Molk injured his toe at the end of the November 8, 2008 Battle for the Little Brown Jug against Minnesota, but he was fine the following week. As the young offense finished the season with a 3–9 record, it expected its entire starting offensive line to return the following season. In fact, considering injuries, the team returned a total of seven offensive linemen who started games. In Molk's second year of spring football he earned the sophomore award for toughness and work ethic during the Michigan spring football awards. By the end of the spring he was among the 44 centers on the 2009 Rimington Trophy spring watch list for the 2009 NCAA Division I FBS football season. He was also included on the watch list for the 2009 Lombardi Award. Molk suffered a broken foot in the third game of the season as the 2009 Wolverines pushed their record to 3–0 and had surgery two days later. He was expected to miss 4–6 weeks. After missing four games, he returned to practice. However, during the subsequent game against Penn State on October 24, he tore knee ligaments and was lost for the season as well as spring football. As a redshirt junior, he was selected to the 2010 preseason Rimington Trophy watchlist for the 2010 Michigan Wolverines football team and later a finalist after the regular season had concluded. That season Denard Robinson established numerous quarterback rushing records lining up behind and often running behind Molk. He broke Drew Brees' Big Ten single-season total offense record of 4,189 yards. Robinson fell 116 yards short of Tim Biakabutuka's Michigan school record of 1,818 rushing yards. However, he led the conference in both total offense and rushing yards per game. Following the Big Ten conference regular season, Molk was a first team All-conference selection by the coaches and second team member as selected by the media. He was also recognized by Sports Illustrated as an honorable mention All-American. As a fifth-year senior he was selected to three preseason watchlists: the Outland Trophy list, which goes to the nation's top interior lineman; the Lombardi Award watch list, which is awarded to the nation's top lineman; and the Rimington Trophy watch list, which is awarded to the nation's top center. During the season, Michigan had two 1000-yard rushers (Robinson and Fitzgerald Toussaint) for the first time since the 1975 team. He earned the 2011 Big Ten Conference Rimington-Pace Offensive Lineman of the Year Award (the first year it was thus named) and was a repeat first team All-Big Ten Conference selection by the coaches and a second team selection by the media. The following week, he was named a finalist for the Rimington Trophy. A few days later, he was declared the Rimington Trophy winner. He was also first team All-American selection by AP, Football Writers Association of America, Scout.com, Sporting News and the Walter Camp Football Foundation, which resulted in him becoming a consensus All-American. He was a third team All-American selection by Yahoo! Sports and an honorable mention All-American selectee by Sports Illustrated and the Pro Football Weekly. Molk was invited to participate in the January 28, 2012 Senior Bowl, and he was an early invite to the February 22–28, 2012 NFL Scouting Combine. Molk was one of 54 offensive linemen, and the fourth-ranked center—behind Peter Konz, Garth Gerhart, and Ben Jones—, that participated in the 2012 NFL Scouting Combine. However, he tore the peroneal longus tendon in his foot at the 2012 Sugar Bowl, and he had surgery on January 13. As a result, he was only able to participate in one Combine event. His 41 reps in the bench press ranked first among offensive linemen and second at the entire combine, behind only nose tackle Dontari Poe. Molk's total was most by a center and ranks third among offensive lineman since 2000, behind only Mitch Petrus and Scott Young, who were both offensive guards. He was selected by the San Diego Chargers in the seventh round of the 2012 NFL Draft with the 226th selection overall. He was one of three Michigan Wolverines and 41 Big Ten players drafted. On May 8, 2012, he signed a four-year contract. He played 12 games for the 2012 San Diego Chargers, mostly on special teams and as an extra lineman in short yardage situations, before being placed on injured reserve on December 4, 2012. Molk was one of 11 players released by the Chargers on August 31, 2013, during the last round of preseason roster cuts. On January 9, 2014, he signed a futures contract with the Philadelphia Eagles. He was placed on injured reserve with a torn bicep after the second game of the 2015 NFL season by the Eagles on September 14, 2015. Molk announced his retirement from the NFL on March 4, 2016. 1 2 3 4 5 Bell, Taylor (2006-05-12). "Everything's working out for Lemont strongman Molk". Chicago Sun-Times. p. 111. Retrieved 2009-10-28. ↑ Bell, Taylor (2009-04-30). "Area football talent in a down cycle: Hubbard's Hughes, Simeon's Wilson are best of subpar class". Chicago Sun-Times. p. A76. Retrieved 2009-10-28. ↑ Bell, Taylor (2006-05-28). "Recruits believe in the buddy system: Pals Wilson, Hughes might pick a school as a package deal". Chicago Sun-Times. p. A76. Retrieved 2009-10-28. ↑ Bell, Taylor (2006-06-09). "St. Joseph duo moving up charts: McCamey, Turner considered among top 25 in the nation". Chicago Sun-Times. p. 109. Retrieved 2009-10-28. ↑ Tucker, Steve and Taylor Bell (2006-08-03). "Commitments starting up again". Chicago Sun-Times. p. 91. Retrieved 2009-10-28. ↑ "The Star All-Area Football Team 2006". The Star. 2006-11-23. p. C2. Retrieved 2009-10-28. ↑ O'Reilly, Tim (2006-11-24). "Daily Southtown All-Area Football Team 2006 -Capsules". Daily Southtown. p. B5. Retrieved 2009-10-28. ↑ "Prep Football: Prep Report names 22 local players to All-Area team". The Star. 2006-12-14. p. C4. Retrieved 2009-10-28. ↑ Sakamoto, Bob (2006-12-03). "Kaneland's tenacious duo - Highlight-reel season of Crosby, Thorgesen elevates small school". Chicago Tribune. p. 12. Retrieved 2009-10-28. ↑ "This & that". Chicago Sun-Times. 2006-11-10. p. 108. Retrieved 2009-10-28. ↑ "Sports Roundup: Lemont seniors play in all-star games". The Star. 2007-01-11. p. C4. Retrieved 2009-10-28. ↑ "School announces first semester honor roll". The Star. 2007-02-08. p. A19. Retrieved 2009-10-28. ↑ Heuser, John (2007-08-26). "Butler feels like he's 'back in the mix' - Reinstated tight end wants to put past behind and look toward the season". Ann Arbor News. p. B2. Retrieved 2009-10-31. ↑ Snyder, Mark (2008-03-16). "Wolverine pain! Rich Rodriguez opens practice tough". Detroit Free Press. Retrieved 2009-10-31. ↑ "Offense". Ann Arbor News. 2008-08-24. p. W5. Retrieved 2009-10-31. ↑ Heuser, John (2008-03-26). "U-M lineman Boren leaves team". Ann Arbor News. p. B1. Retrieved 2009-10-31. ↑ Snyder, Mark (2008-04-10). "Rich Rodriguez interview Part 2: On the running game, receivers". Detroit Free Press. Retrieved 2009-10-31. ↑ Heuser, John (2008-04-13). "New faces dot offense - Schilling is the only returning regular; some have never started". Ann Arbor News. p. B6. Retrieved 2009-10-31. ↑ Asmussen, Bob (2008-04-16). "Spring football". The News-Gazette. p. B-3. Retrieved 2009-10-31. ↑ Rezler, Rich (2008-08-25). "Up for the challenge - U-M's green group of offensive linemen ready to go". Ann Arbor News. p. B1. Retrieved 2009-10-31. ↑ Carty, Jim (2008-09-06). "Wolverines need time, patience". Ann Arbor News. p. H2. Retrieved 2009-10-31. ↑ Heuser, John (2008-09-30). "Offensive line to change again - More improvement is necessary from the entire unit, Rodriguez says". Ann Arbor News. p. B5. Retrieved 2009-10-31. ↑ Robinson, Ian (2008-11-10). "Michigan QB Threet's status uncertain for Saturday". The Michigan Daily. Retrieved 2009-10-31. ↑ Heuser, John (2008-11-30). "Michigan looks to leave '08 behind - Offense returns every starter, but defense loses six". Ann Arbor News. p. B1. Retrieved 2009-10-31. ↑ Vardon, Joe (2009-02-06). "UM line recruits have tough tasks". The Blade. p. C1. Retrieved 2009-10-31. ↑ Snyder, Mark (2009-04-12). "QB Denard Robinson misses game but is learning plays". Detroit Free Press. Retrieved 2009-10-31. ↑ Shelton, Shannon (2009-05-21). "MSU center Joel Nitchman on Rimington watch list". Detroit Free Press. Retrieved 2009-10-31. ↑ "Big Ten Football Weekly Release September 7, 2009" (PDF). Big Ten Conference. 2009-09-07. p. 6. Retrieved 2009-10-01. ↑ "No word on Clausen's MRI, but Weis remains optimistic". Chicago Sun-Times. 2009-09-22. p. 53. Retrieved 2009-10-31. ↑ Chengelis, Angelique S. (2009-10-22). "U-M center David Molk likely to start vs. Penn State". The Detroit News. Retrieved 2009-10-31. ↑ "Michigan loses C Molk for season with injured knee". Associated Press. 2009-10-26. Retrieved 2009-10-31. ↑ "Molk Named to Rimington Trophy Watch List". MGoBlue.com. CBS Interactive. 2010-08-26. Retrieved 2010-09-11. ↑ "College Football Awards Watch". Retrieved December 7, 2010. ↑ "Big Ten Conference Football Full Media Guide". CBS Interactive/Big Ten Conference. January 5, 2010. p. 37. Retrieved November 11, 2010. ↑ "The Automated ScoreBook: 2010 Big Ten Conference Team Statistics Through games of Jan 07, 2011". CBS Interactive. 2010-01-07. Retrieved 2010-01-07. ↑ Bigelow, Pete (2010-11-29). "Michigan's Denard Robinson named Big Ten's Offensive Player of the Year, other Wolverines honored". AnnArbor.com. Retrieved 2010-11-30. ↑ "Big Ten Announces 2010 Football All-Conference Teams and Individual Honors". CBS Interactive. 2010-11-29. Retrieved 2010-11-30. ↑ "Robinson Named Big Ten Offensive Player of the Year". CBS Interactive. 2010-11-29. Retrieved 2010-11-30. ↑ "SI.com's 2010 All-Americas". Sports Illustrated. 2010-12-14. Retrieved 2010-12-14. ↑ "Michigan seniors David Molk, Mike Martin on Outland Trophy watch list". AnnArbor.com. 2011-07-08. Retrieved 2011-07-09. ↑ "Martin, Molk Named to Rotary Lombardi Award Watch List". MGoBlue.com. CBS Interactive. 2011-07-13. Retrieved 2011-07-12. ↑ "Michigan center David Molk named to Rimington Trophy Watch List". AnnArbor.com. 2011-05-19. Retrieved 2011-07-18. 1 2 3 "Molk Wins Rimington Trophy, Walter Camp First Team All-America Honors". MGoBlue.com. CBS Interactive. 2011-12-08. Retrieved 2011-12-09. ↑ "Molk Named Top Offensive Lineman to Headline Big Ten Awards". MGoBlue.com. CBS Interactive. 2011-11-28. Retrieved 2011-11-29. ↑ "Big Ten Announces 2011 All-Big Ten Teams and Select Individual Award Winners". BigTen.org. CBS Interactive. 2011-11-28. Retrieved 2011-11-29. ↑ "Molk Named One of Six Rimington Trophy Finalists". MGoBlue.com. CBS Interactive. December 5, 2011. Retrieved December 7, 2011. ↑ "AP All-America Team, List". CNN Sports Illustrated. 2011-12-14. Retrieved 2011-12-14. ↑ "FWAA Names 2011 All-America Team". Football Writers Association of America. 2011-12-10. Retrieved 2011-12-10. ↑ "FoxSportsNext.com 2011 All-America Team". Scout.com. 2011-12-09. Retrieved 2011-12-09. ↑ "Sporting News' All-American team". Sporting News. 2011-12-15. Retrieved 2011-12-15. ↑ "Five Big Ten Standouts Named Consensus All-Americans". BigTen.org. CBS Interactive. 2011-12-20. Retrieved 2011-12-24. ↑ "SEC dominates 2011 All-America Team". Yahoo! Sports. 2011-12-08. Retrieved 2011-12-28. ↑ Nawrocki, Nolan (2011-12-12). "PFW 2011 All-America team". Pro Football Weekly. Retrieved 2011-12-13. ↑ "SI.com's 2011 All-Americas". Sports Illustrated. 2011-12-13. Retrieved 2011-12-14. ↑ Rittenberg, Adam (2012-01-11). "Big Ten all-star roster updates". ESPN. Retrieved 2012-01-11. ↑ Rothstein, Michael (2012-01-20). "Koger eager for all-star showcase: Tight end joins Hemingway at East-West Shrine Game, hope to earn combine invite". ESPN. Retrieved 2012-01-21. ↑ "Combine Participants (By position - OL)". NFL.com. Retrieved 2012-03-01. ↑ "Participants". NFL.com. Retrieved 2012-02-29. 1 2 Meinke, Kyle (2012-02-25). "Michigan's David Molk talks about overcoming injury to post strong combine, create buzz". AnnArbor.com. Retrieved 2012-02-29. 1 2 Meinke, Kyle (2012-02-26). "David Molk opens up about playing through a torn tendon, rehab and proving his doubters wrong". AnnArbor.com. Retrieved 2012-02-29. ↑ "Top Performers (Bench Press)". NFL.com. Retrieved 2012-02-29. ↑ "Top Performers (Bench Press - OL)". NFL.com. Retrieved 2012-02-29. ↑ Tadych, Frank (2010-02-26). "Arkansas' Petrus ties combine record in bench press". NFL.com. Retrieved 2012-03-01. ↑ "OL35 David Molk C Michigan", NFL.com, retrieved 2012-02-29 . ↑ "2012 NFL Draft Central". BigTen.org. CBS Interactive. 2012-04-28. Retrieved 2012-04-28. ↑ Meinke, Kyle (2012-05-08). "Michigan's David Molk not changing lifestyle after signing 4-year deal with San Diego Chargers". AnnArbor.com. Retrieved 2012-05-14. ↑ Henne, Ricky (2012-12-04). "Chargers Sign Baxter, Schilling; Ajirotutu, Molk Placed on IR". Chargers.com. Retrieved 2012-12-07. ↑ Henne, Ricky (2013-08-31). "Chargers Release 11 from Roster, Get Down to 53". Chargers.com. Retrieved 2013-08-31. ↑ Mosher, Geoff (2014-01-09). "Eagles sign center David Molk to futures deal". Comcast SportsNet. Retrieved 2014-02-11. ↑ Gantt, Darin (2015-09-16). "Eagles put backup center David Molk on IR with biceps tear". NBC Sports. Retrieved 2015-09-16. ↑ Florio, Mike (2016-03-04). "Eagles offensive lineman David Molk retires". NBC Sports. Retrieved 2016-03-10.